· Tuition is based on an academic year. Students must register each year. The total number of classes for each level and for each class during the year will vary depending on the calendar and on school vacation days. Ballet Arts Studio follows the Beacon School District holiday schedule, with occasional exceptions-- please refer to our Studio Calendar. · An Installment Payment Plan of quarterly payments every eight or nine weeks is available for your convenience. Please remember that paying tuition in installments of every eight or nine weeks does not mean that there will be eight or nine classes at each class level during the installment period. Tuition is due on the first day of each installment period. Ballet Arts Studio does not mail installment payment notices so we ask parents to please mark the calendar. There is a $15.00 late fee for tuition received more than ten days after the due date. · Make-up classes are available for most classes and must be taken within the month a class is missed. Please call the Ballet Arts Studio office to schedule a suitable make-up class. Preparation for Ballet and other classes which meet once each week do not have make-up classes. · Refunds will be reviewed on a case-by-case basis, and must be arranged through the Ballet Arts Studio office. Tuition fees may be refundable, but only within the first two weeks of each quarter. Refunds are not available for involvement with sports teams, snow cancellations, school plays, personal vacations, family visits, or routine childhood illnesses. · Weather related closing decisions are made by 2:30 pm on the weekday in question, and by 7 am on Saturdays. Information regarding closings will be on our phone system and on local radio stations, and emails will be sent to the parents of current students. Make up classes are not available for weather related closings. · Vacations and Holidays: All Beacon City School holidays and vacations are observed unless otherwise posted. Please refer to our Studio Calendar. 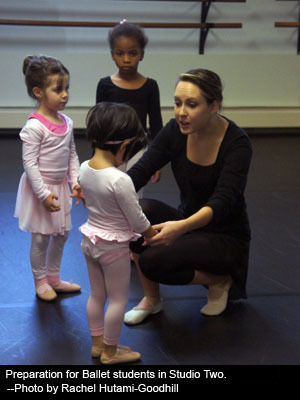 · Office hours: Ballet Arts Studio faculty and staff are available by appointment through our office. Please feel free to contact us at 845.831.1870 if you have any questions.